The Buffalo Sabres will play a "home" game in New York City against the New York Rangers next year, so the Rangers can keep their special tax exemption. Every January, the National Hockey League rings in the New Year with one of the more unique traditions on the American sports landscape: The Winter Classic, an outdoor hockey game played in a football or baseball stadium. Next year, the NHL announced this week, that game will be an intra-state battle between the New York Rangers and the Buffalo Sabres, and the contest will be played at Citi Field, home of baseball's New York Mets. 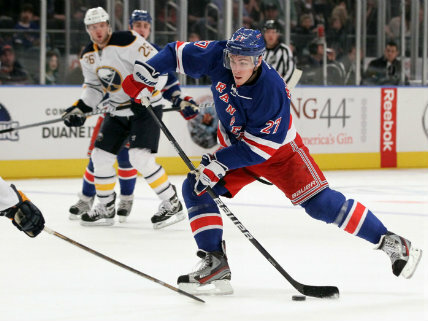 The stadium is located in Queens, less than 10 miles from Madison Square Garden, where the Rangers' normally play, but the Sabres will be the "home" team for the game, despite the fact that they hail from a city more than 350 miles away. The reason, as the Rochester Democrat and Chronicle uncovered this week: tax breaks. Specifically, one very peculiar tax break that applies only to Madison Square Garden. Thanks to state lawmakers in New York, the "most famous arena in the world" is also one of the least taxed. Madison Square Garden has a full exemption from property taxes, but the exemption is contingent on having both the National Basketball Association's New York Knicks and the NHL's Rangers remain full-time residents of the building. Playing even one home game somewhere else could cost the arena's owners—who also happen to own both teams—as much as $42 million annually. The special exemption was written into state law in 1982 in an effort to keep the Knicks and Rangers from following through on threats to leave Manhattan for a new stadium. It certainly accomplished that, but it's hard to justify such a narrowly tailored giveaway that benefits just a single business at the expense of all other New Yorkers. The Madison Square Garden Company, which owns the arena and the two teams, certainly doesn't need the corporate welfare. According to the D&C, the publicly traded company has a market value of more than $4.8 billion. New York City's Independent Budget Office—basically the city's number-crunching equivalent to the Congressional Budget Office—says the Madison Square Garden tax exemption is worth an estimated $42 million for the city's upcoming fiscal year (up from just $17 million in 2013, before a $1 billion renovation of the arena). There have been efforts to kill the tax exemption, most recently in 2016 when a proposal to eliminate the special giveaway was voted down in committee. For what it's worth, the NHL says the decision to make Buffalo the nominal home team in next year's Winter Classic was influenced by "a variety of factors." But when the Rangers played an outdoor game at Yankee Stadium—also as the road team, against the New Jersey Devils—in 2014, The New York Times noted that the Madison Square Garden tax break was likely the reason. Aside from highlighting one of the best examples of crony capitalism in New York's tax code, the whole situation says something about the unintended consequences of government policy. The state lawmakers who crafted this special property tax exemption for Madison Square Garden probably never intended to create a situation where the Buffalo Sabres would be playing a home game in Queens—for that matter, they probably never even considered the possibility of outdoor NHL games, something the league didn't start doing until the early 2000s. Policymakers can never foresee all the consequences of their actions. As unintended consequences of narrowly-tailored tax rules that benefit one special interest go, this is probably one of the least consequential. The fact that the Rangers will be the road team despite being closer to home won't affect the outcome of the game, and the loss of one true home game probably won't change the trajectory of Buffalo's season. Still, people and businesses respond to economic incentives. Apparently, $42 million of economic incentives are enough to invert the geography of New York State—at least for one day. As unintended consequences of narrowly-tailored tax rules that benefit one special interest go, this is probably one of the least consequential. I’ll say. The Sabres are still going to lose. But NYC needs to tackle a whole host of self-made problems before thinking about dealing with MSG tax breaks. My first thought was that at least it’s money the city’s not getting its grubby paws on, but given that it furthers the entrenchment of crony capitalism as business-as-usual I’m not so sure giving NYC an extra $42 mil to squander isn’t preferable. Or maybe it’s the same thing – whether the shitweasels at City Hall allow the shitweasels in the boardrooms to keep the money or they take it away and give it back to them in some other form, it’s still shitweasels winding up with the money. It’s sort of like Madison’s admonishment about government: If men were angels they could be trusted with the power of government, but if men were angels they wouldn’t need government in the first place. The fact that men need governing is a good indication they can’t be trusted with the power of government. If government could be trusted to spend that money more wisely than the MSG corporation they deserve to have it, but the fact that they’ll grant tax exemptions to their rich buddies is a pretty good indication they can’t be trusted. So screw the whole lot of them and unless and until New Yorkers get fed up enough to start stringing the pols up from lamp-posts I don’t really have any sympathy for them. There are two reasons to resent these kinds of tax breaks more than most. One, it gives people more excuses for conflating cronyism and free markets. It’s just more ammunition for Lizzie Warren and Bernie Sanders to show how corrupt the system is, while conveniently glossing over it is government at fault, and their proposals simply expand government and the possibilities for corruption. Two, when the powerful get tax breaks, governments make up for it elsewhere, meaning the middle class. This just gives those same statists more ammunition for one of their favorite slogans, “make the rich pay their fair share”. Never mind that taxation is theft or that government is corruption. We must force the rich to pay more, which means more opportunity for corruption like this. Total tax burden will go up, total cronyism will too, and the middle class get shafted again, because the poor have no skin in the game and like the idea that everyone richer is paying, regardless of how poorly distributed. Which is why Madison recommended an anarchist utopia right? Right? That’s what he recommended right because otherwise this would just be a silly rhetorical game that gets us no closer to understanding what level of government is necessary. And if anything you are using Madison’s words in the opposite way of his intent. The supposed paradox he was using was a means to argue for stronger government albeit a stronger government limited by certain restrictions. The fact that men need governing in no way was meant to suggest they are incapable of governing, just that certain decisions should be outside the governments purview. That’s an exaggeration. What the founders were creating had never been created before, and they didn’t do a perfect job. But for a first attempt, it was pretty damned good, and it has to be seen in that light. The idea of no government wasn’t even a concept except for a few hermits who could go off into Indian territory and act like pioneers. What Madison meant was checks and balances. The fact that later generations removed some of them (direct election of Senators) and misinterpreted others (Commerce Clause, Necessary and Proper Clauses, even the Slaughterhouse cases) should not detract from respect for a pretty good first attempt. * Allow anybody to sue to overturn a defective law or regulation. * Allow a majority of states to legislate repeal of any Federal law or regulation. * Make it explicit that all government officials can be held accountable as ordinary citizens. Not for bad policies, but for violating laws; no absolute or qualified immunity. * Make it even more explicit that the Federal government has only a few enumerated powers, but that one of those is bringing suit to overturn unconstitutional state laws. * Mandate loser pays in all legal matters, so that ordinary citizens need not fear the practically infinite government purse, and so that no one need fear the vexatious litigator. In short, put accountability back into the equation. Almost every expansion of government has come about because there is no accountability for unconstitutional actions. You can’t prevent the attempts, any more than you can prevent them in private business, as much as Progressives like to pretend so, in order to have government fix market failures. But you can bring accountability back into the picture, which is the primary advantage of competition in markets. Strange that Pennsylvania Station in NYC was demolished in part because NYC taxed it heavily at a time when Pennsylvania Railroad was losing money on passenger travel so the Pennsylvania Railroad demolished the upper part of the station and sold the “air rights” to what became Madison Square Gardens. the unintended consequences of government policy. To be fair, all policies and actions have unintended consequences. The primary specialty with government actions is no market accountability. Voters just don’t matter in these cases. Government actions are also abnormally retarded for the same reason — where else can the incompetent go and actually prosper? Family businesses come to mind, but they remain small, so they still are held accountable by markets. That’s true only if you consider part of their $ as belonging to all other New Yorkers, and their being allowed to keep it is a giveaway by all other New Yorkers. Face off, pucker. I thought that was a little better than puck off, blader. And speaking of crooked New Yorkers, General Cheeto assured the right-wing wackjobs at Falwell University yesterday that, “In America we don’t worship government, we worship God,” to which more than a few “libertarian” mystics nodded their noggins in joyous stupefaction. I was waiting for him to admit he was a sinner. Well, at least I learned why the food nazis hate MSG. This actually happened with the Rams here in St. Louis. Of course, the Rams then left a couple seasons later, so moot point. Besides which, baseball has really lost its mojo since testing became policy. The game may be more “classical”, but it seems to be going back to the days of watching the lawn grow Kodi Download. Of course, the Rams then left a couple seasons later, so moot point. Besides which, baseball has really lost its mojo since testing became 1337x.to proxy. The game may be more “classical”, but it seems to be going back to the days of watching the lawn grow kissanime apk. Of course, the Rams then left a couple seasons later, so moot point.